We are engaged in importing and supplying a comprehensive range of Valves that helps in regulating the flow of liquids through a sequence of pipes. Resistance to water, durability and high end functionality makes these valves highly acclaimed across the country. Moreover, procured form reliable vendors, who manufacture these valves utilizing quality raw material, these valves can also be customized as per the technical specifications given by the clients. Neoseal gate valves are heavy duty, outside screw & yoke type, bolted bonnet, rising stem with non rising hand wheel. Straight through bore design assures minimum turbulence, erosion and resistance to flow. The most advanced design features provides the ultimate in dependable, economic flow control. They are available in wide range of sizes and weights. These are widely suited for high pressure and temperature and variety of fluids. Gate valves are adequate for all service media along with Hydrogen service, Oxygen service, Hydrocarbon service and NACE applications. Other optional features like Live loading, lantern ring, Bleed holes, purging lines and other features are available on request. Neoseal globe valves are heavy duty, outside screw & yoke type, bolted bonnet, rising stem and hand wheel. Valves are highly efficient for services requiring frequent operation and throttling. The internal passage within the valve diverts flow through 90º changes of direction resulting in pressure drop and turbulence. The most advanced design features provides the ultimate in dependable, economic flow control. They are available in wide range of sizes and weights. 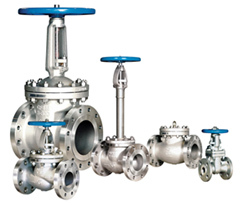 Globe valves are generally considered where moderate control or regulation of flow is required. Globe valves are adequate for all service media. Valves are marked with flow direction since they are recommended to install with flow and pressure under the disc. It can also be installed in reverse condition depending upon the conditions. The globe valve is generally faster to operate due to less travel. But requires much force to operate compared to gate valves. Neoseal check valves are heavy duty, bolted cover, renewable seat ring, and body mounted disc swing type. Valves are straight through flow which works automatically. They are opened by the force of velocity pressure and closed by the force of gravity and back pressure. The valves are single direction flow and restrains flow in opposite direction. Distortion, wear and noisy operation of the valve can be avoided by selecting the size of the valve on the basis of flow conditions. Swing Check valves are best suited for moderate velocity operations. Swing check valves are normally designed for horizontal installations. It can be installed in vertical direction with flow in upward under the disc. There is no tendency for seat to gall because the disc meets flat surface without rubbing upon contact. The most advanced design features provides the ultimate in dependable, economic flow control. They are available in wide range of sizes and weights. Flow directions are marked as cast on the body for ease of installation. Swing Check valves are adequate for all service media. Valves can also be supplied with counter weights and dash pot arrangement depending upon the condition and request. Stelcom Trunnion Mounted Ball Valve is the result of Innovative engineering. It embodies all the quality, Performance, value and safety features required for critical applications. In Trunnion Mounted Ball Valve, the ball rotates without moving on the horizontal axis, where as seats are floating and free to move on the same axis. As the pressure increases the force on the seat ring by the pressure pushes towards the ball giving 'BIDIRECTIONAL' sealing. Thrust due to (Fluid Pressure + spring) both on the upstream and downstream, pushes seat ring towards the ball for positive sealing under all conditions. When the valve is in closed position, the fluid trapped in the body cavity is subjected to thermal expansion and the valve cavity pressure increases. The excessive pressure buildup within the valve cavity is relieved automatically when the pressure inside exceed the spring load on the seat. Internal Trunnion reduces the chance of fluid leakage to the atmosphere as in the case of external Trunnion Mounted ball Valves. Stelcom Cryogenic valves, except check valves are supplied with extended bonnet with a sufficient gas column length. Usually supplied by the user, to eliminate any chance of frosting of the packing area. The cryogenic valves are installed on applications involving the production, transport and storage of liquefied gases such as oxygen, nitrogen, argon, natural gas, hydrogen or helium down to -254ºC. The cryogenic valves are designed with compliance of ASME B16.34 and BS 6364. The cryogenic tests are performed in fully equipped in-house facilities, according to BS 6364. Stelcom High pressure valves (pressure seal type) offer high performance, reliability and safety. The valves are especially suitable for high pressure and high temperature applications in steam, oil and gas processing, power industry and in the chemical and petrochemical industry. Oswal's High Pressure series Gate, Globe & Check valves are the result of development of new technology with uncompromising standards of design excellence, product quality and integrity. Engineered for rigorous performance, and strict manufacturing processes are adhered to in order to maintain consistent compliance to various international standards. Material WCB, LCB, WC6, WC9, C5, C12, CF8M & Others. General Application High Pressure and High Temperature applications like Steam, Oil and Gas Processing, Chemical and Petrochemical Industry and in the Power Industry.